The purpose of all our ProductCart technology is to make it easy for business owners to customize and maintain their website to meet their specific needs. With every ProductCart e-commerce website, business owners have the ability to provide their customers with easy-to-find links for all their social media accounts, including Facebook, Tumblr, YouTube, etc. The e-commerce site owner can simply log into their ProductCart account and provide URLs for each of their social media accounts. ProductCart also gives the option to add small, clickable icons for each of the social media accounts directly onto your website. Another unique tool that can be added to your ProductCart site is a Facebook widget that allows you to automatically sync your e-commerce website with your Facebook events, helping you eliminate the time you would have spent copying each event to your website manually. The Facebook syncing widget takes events that you put into your Facebook and places them in an organized list format on your web page. Facebook also gives you the ability to include additional content about the event, such as photos and links, within the posts. This particular widget is not a feature of ProductCart, but can be added upon request. Finally, ProductCart allows you to integrate your actual store right into your Facebook page, which highly increases your reach to potential customers. By easily creating an app on your Facebook account, you can give your Facebook followers the ability to shop for your products directly on your Facebook page. If they see a product they want to buy, they can click the image and be taken directly to your ProductCart store to make their purchase. Customers can also go to the ProductCart website first, and log into their account using their Facebook username and password. Social Media has become a great marketing tool for business owners, and is an excellent way to connect with your current and potential customers. Having the ability to integrate your e-commerce website with your social media accounts is just one of the many ways ProductCart can help you grow your online business. 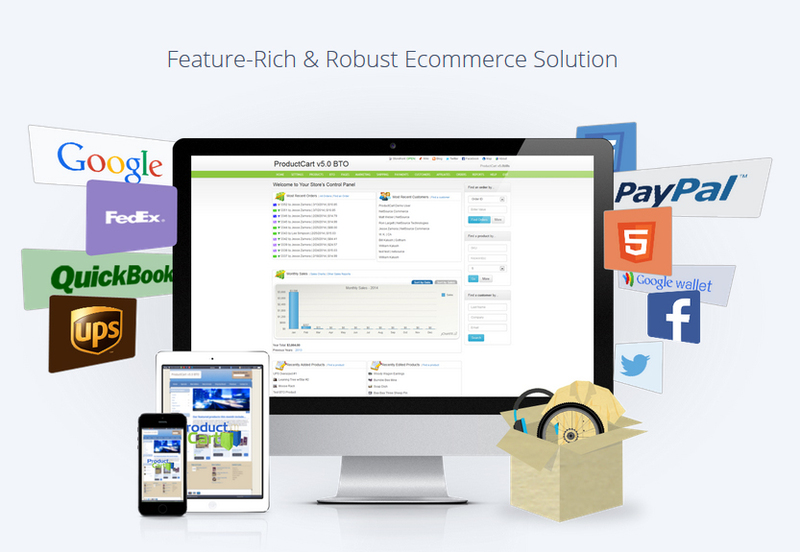 For more information about ProductCart’s features or unique e-commerce solutions, please visit our website www.productcart.com. Feel free to contact us with any questions, and keep checking our blog and Facebook page for the latest updates on e-commerce technology!